Stone Vessel Sink in White Phoenix with Otis Faucet in Brushed Nickel is rated 4.5 out of 5 by 8. Rated 5 out of 5 by Twoboyzzmom from We’ve had the sinks (2) installed for a couple of... We’ve had the sinks (2) installed for a couple of weeks now. I really love the way they look. We hired a plumber to do the install, he didn’t seem to have any problems. We will be replacing 2 more bathroom sinks in the future, and I’m pretty sure we’ll be getting a couple more of these. Rated 5 out of 5 by JL Harnden from Perfect vessel sink Enhanced our bathroom. Great quality, very satisfied. Rated 5 out of 5 by Handiguy from Excellent Quality Everything my wife wanted in a Vessel sink and faucet combination. She was thrilled with this product. Rated 1 out of 5 by SellingMyHouse from Take a picture so you can remember what it looks like This sink faucet combo is very nice looking. Unfortunately, it didn't last long. Approximately one month after install, the sink spontaneously shattered at 2:30 am. Warranty is voided because it was not installed by a professional? Complete nonsense. This is the poorest purchase I have ever had at HD. The sink is very nice for the vessel style. It has plenty of depth and a large diameter and probably holds more volume than a traditional sink. Rated 5 out of 5 by Rivahbiker from Great product Easy to install. Package included everything need for installation. Looks great on my new marble tile vanity top. Rated 5 out of 5 by Mac44 from Wow. Looks great. Looks great. Works well. Very good purchase. Easy to install. Rated 5 out of 5 by Codyjas from What A Great Surprise! Bought this sink for a bathroom remodel. The quality of the set is pretty impressive, so it should last for a while. The inside of the sink is reflective which isn't bad, but was a little surprise. Would definitely recommend this set! 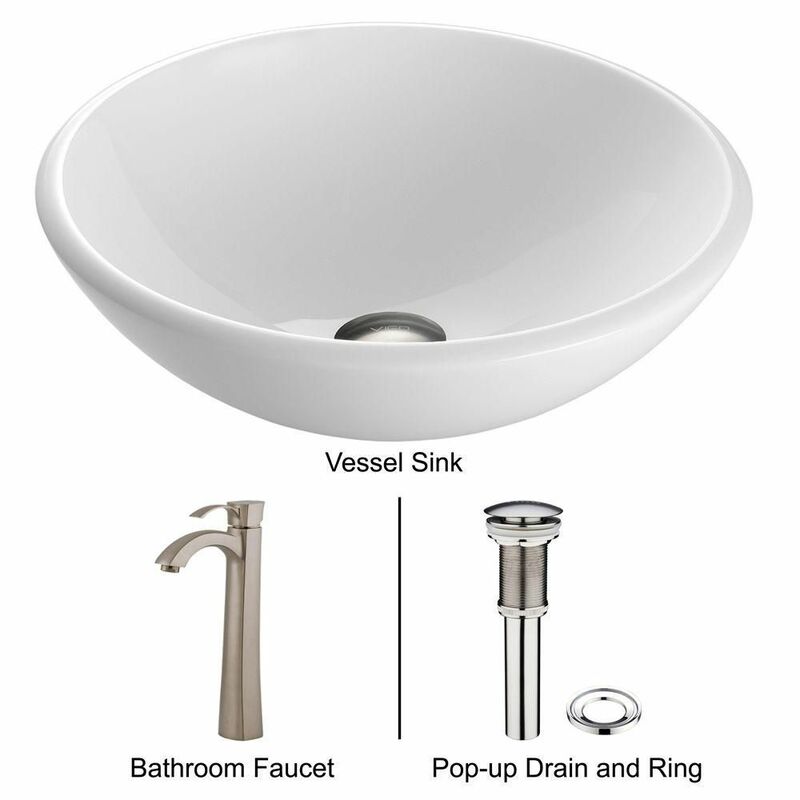 Rated 5 out of 5 by justin from Looks beautiful, great quality The faucet and vessel sink look amazing! Right when you open the box you know the quality is superior. They packaged it very securely so there were no issues during shipping. The material came in nice tied cloth bags for extra protection. The sink is sturdy and defect free. The sink is super quiet even when most faucets run louder in my house due to higher water pressure. Outstanding!